The Canadians are coming! The Canadians are coming! In the late 1880s, four Canadians, including Sir Sandford Fleming’s son, Sandford H. Fleming, traveled to the State of Florida to enter into a subcontract with the Florida canal company to perform a portion of the work in the Matanzas-Halifax River Cut joining St. Augustine and today’s Ormond Beach, just above Daytona Beach. Sir Sandford Fleming had won world-wide acclaim as chief engineer of the Canadian Pacific Railway, the designer of Canada’s first adhesive postage stamp, and the inventor of the 24 time zones around the world known as Universal Time, making it easier for railways to create timetables for arrivals and destinations around the world. The particulars of the early Florida work performed by the junior Fleming are to date unknown. We do know that after a time the Canadian group failed to complete the work, owing a substantial sum in damages to the Florida canal company. The Canadians wouldn’t be in a position to repay the debt until almost thirty years had passed. Meanwhile, several officials of the Florida canal company and a Newburyport, Mass. banker, Albert P. Sawyer, formed the Boston and Florida Atlantic Coast Land Company to buy 100,000 acres of the Florida canal company’s state land grant at a dollar an acre for $100,000. Sawyer also created three land trusts to buy more canal company land, restoring the canal venture’s coffers to further dredging work down the Florida peninsula into the Indian River. 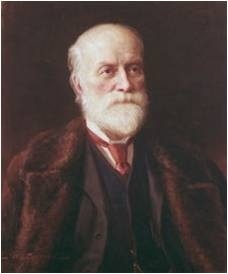 Soon Sir Sandford Fleming became the largest stockholder in the Boston & Florida land company after company officials made the stock exchangeable in land owned by the company. This entry was posted in Atlantic Intracoastal Waterway, Boston and Florida Atlantic Coast Land Company, Daytona Beach, dredging, Fla., Florida Coast Line Canal and Transportation Company, Florida East Coast Canal, Indian River, Jacksonville, Land History, Matanzas Inlet, Matanzas River, Miami, Saint Augustine, Transportation history, Waterway History on July 31, 2014 by Florida's Big Dig.